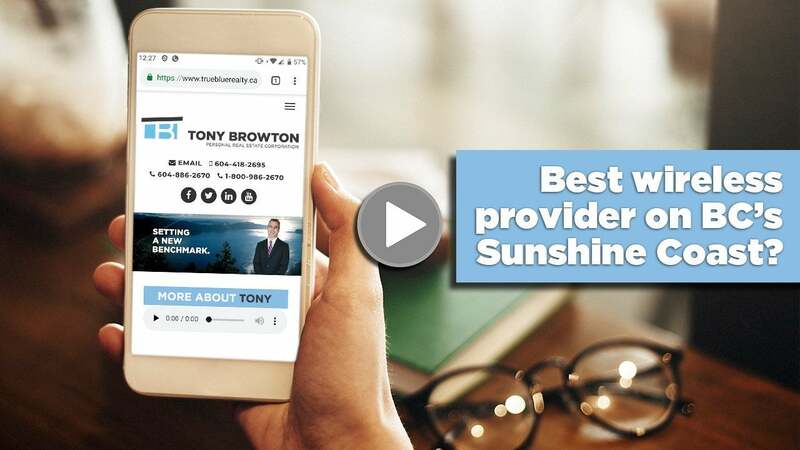 Who is the best wireless provider on BC's Sunshine Coast? Despite paying some of the highest wireless rates in the world, 70 per cent of Canadians have a smartphone. How can you make sure you’re getting the best cell service on BC’s Sunshine Coast? A CCTS report shows that Bell received the most customer complaints followed by Rogers. Of the Big Three, Telus had the fewest. According to the Canadian Cellular Towers Map, Rogers has five towers on the Sunshine Coast. Bell has no towers however, Bell and Telus have a history of sharing infrastructure. Lastly, Telus is shown to have dozens of towers. Prices change so frequently, it’s impossible to say who provides the best deal. One tip is to include Virgin, Koodo, and Fido in your comparison shopping. They’re owned by the Big Three and provide identical service, often at substantial discounts. While it’s difficult to say who provides the best cell service, Rogers’ high number of complaints and low number of cell towers puts them on the bottom of my list. My advice would be, if you’re moving from Vancouver and have a Rogers cell phone, change to Telus before you make the move.